The above image is a segment of exon 4 from the human gene for the Oxytocin receptor (Oxtr). But this ain’t no ordinary exon. 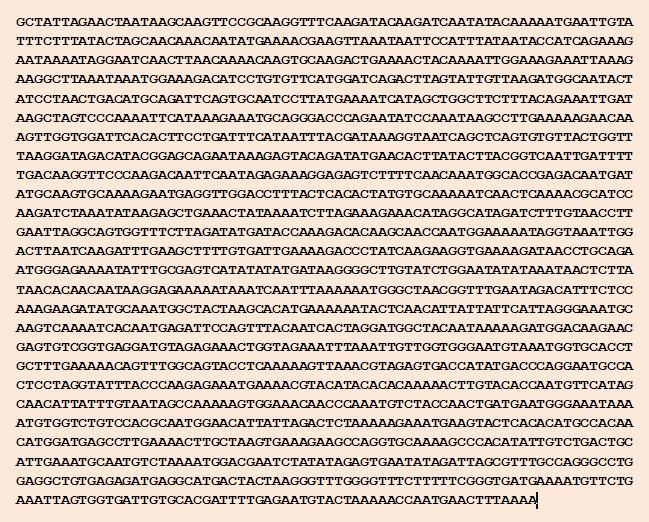 This particular segment is in fact a remnant of what is known as a LINE1 (L1) transposable element. To “transpose” means to transfer from one place to another and so as you might infer, a transposable element is a segment of DNA which is capable of moving from one location in the genome to another, usually a nearby location. Transposable elements occur in two main forms, transposons and retrotransposons. A transposon is simply a segment of DNA that is capable of excising itself from its location within the genome and reinserting itself elsewhere. A retrotransposon, however, doesn’t actually excise itself but transcribes an RNA version which is subsequently used to reverse transcribe into its DNA form. That DNA then inserts itself into another segment of genome. This is basically how a retrovirus like HIV works. About 50% of the human genome contains transposable elements, although the majority have mutated such that they are no longer capable of transposition or retrotransposition . There are four main categories of mobile elements in humans: the long interspersed elements (LINE), the short interspersed elements (SINE), the long terminal repeats (LTR) which also includes many retroviruses, and DNA transposons; all but the last category are retrotransposons. Only two subcategories remain transpositionally active in the human genome, the LINE1’s and Alu’s, the latter a remarkably successful SINE. You will often see SINE’s occurring in close relation to LINE’s because SINE’s are what are known as non-autonomous elements, meaning that they do not actually code for any gene products and are therefore dependent on latching onto a LINE in order to piggyback their way into the genome. Using the Oxtr gene as an example, because this L1 has managed to latch itself onto the tail end of an exon (though it doesn’t actually overlap with any protein-coding sequence) we can easily see how our own cell’s transcription machinery has been exapted to transcribe an RNA copy of this L1 element. One can only wonder what this particular L1 transcript might be doing within the cell, for good, bad, or neutral. I have no doubt many such transcripts litter our cells, taking part in incalculable interactions. In future we’ll see whether that prediction stands the test of time. I’m currently working on a paper involving transposable elements, focusing on how even extinct mobile content may be affecting genetic stability and confounding disease susceptibility. We have some very exciting results and I look forward to sharing them once we’re accepted for publication. However, what I can say now is that there do seem to be distinctly positive links between mobile element content and overall gene instability. Another fine thread here. Have you noticed how your following has grown? I have. Well, I finally received my copy. Despite the deplorable English composition, the subject matter is not only interesting, I think you’d find it has some very interesting relation to the topics you’re considering here and elsewhere in your work. “Probing Allostery Through DNA” by KIM, S. et al. Though the fine points are well beyond my level of understanding, you’d be able to recognize whether one of both of these articles are relevant here. So, I wonder: Related? Relevant? to your comments? But it really is all about DNA conformation, it’s shape, and how changes in that shape can allow other elements to bind (or not). Some of this is not only seen with other binding elements but is part of the nature of the primary DNA sequence itself. You’ll note that in the article the authors mention that GC-rich sequences attenuate the oscillation? In large part, as befits the topic of the article, this is probably due to the fact that GC-rich sequences tend to have smaller major grooves, which basically provides a poorer platform for binding. On the other hand, TA-rich sequences, such as the well known polymerase-binding TATA box for instance, generally adopts a wide major groove. Mind you ions which bind to these grooves likewise change the local DNA topology, just as would a regulatory protein or RNA– and water molecules also aid in giving DNA its typical structure. Some elements preferentially bind the minor groove, however, such as the nuclease, DNase I. So the “major groove is the typical binding platform” is a generalization, not a rule. In fact, a variety of non-traditional conformations can occur during positive supercoiling (more strain on the strand) because with greater intensity of twist, the greater the energy required to maintain the typical B-DNA double helical formation. So, on average, atypical structures like hairpins, triple helices, tetrahelices, slippage events, and other random-coil structures are more likely to occur under conditions of positive supercoiling. Some interactions probably require such atypical conformations in order to occur– or conversely they may result in the same. In either case, some of these atypical events may require excision and repair, leading to instances of misrepair and a loss of original sequence integrity. This is one reason I’m interested in transposable elements, even the extinct ones, for the possibility that these sequences share sequence characteristics which provide binding platforms and perhaps even instability under certain conditions. Either this or they are inherently attracted to unstable regions for insertion, perhaps even promoting further instability. For instance, in viewing a great many extinct transposable elements in various human genes, I can say, for instance, portions of these elements are heavy in TA content. Other segments of these elements are likewise heavy in GC content. As a simple interpretation this may suggest that many transposons, particularly extinct retrotransposons, house suitable binding platforms for regulatory interaction with their TA-rich content, and meanwhile provide islands for methylation with their GC-content. Much research on the latter has suggested that methylation is important for transposon suppression and genome stability, but there is a smaller body of work to suggest that, in open conformation, methyl groups actually STABILIZE the conformation and do not instead close it down, so it may also lead to instability as well under these circumstances. An excellent recent article if you’re interested in continuing this topic of study is here: http://rsta.royalsocietypublishing.org/content/370/1969/2960.short –I don’t remember whether I’ve provided that before or not, but it’s a favorite of mine. Chocked full of information, so take it slowly if you read! I don’t know whether you’re associated with a university or not, but if you’re not and don’t have access to the full article just email me and I’ll send it to you. And thanks again for the article. Extremely useful! Yes, I have a pretty good access to certain on-line science reviews–but not, I think, as good as your probable access. As for the Royal Society’s papers in this case, I don’t know yet until I’m at one of the academic libraries I frequent whether or not I can get the full text of the article; but, when I’ve had a chance to check on it, I’ll let you know because, yes, if you consider it a very good piece of background work, then I’m quite interested in having a look at it. Copyright: © 2013 Herron, Doebeli. This is an open-access article distributed under the terms of the Creative Commons Attribution License, which permits unrestricted use, distribution, and reproduction in any medium, provided the original author and source are credited. but “Metapress” is new to me & I’m not having any success in locating it there–despite all the references your link offers, title, author, “doi” ref., etc. And, as for your link, in clicking on the “full text” option, I’m prompted to sign in. Ideally, I’d rather figure out how to solve the access issue from here–so, uh, maybe I oughta “Ask a librarian!” ;^) how to use the proposed site correctly–that way, I’d have learned something useful rather than having to use a work-around solution– your sending the article via e-mail, that is. Sounds far more complex than it needs to be, hehe. I like that at the uni here, we simply have to be using the campus internet to be automatically signed in on most journal websites, so it’s nicely automated. Also, Google Scholar gives an option for searching via the university. Maybe give that a shot? As a last ditch effort, just email me if you’re unsuccessful. Best of luck! Mon dieu! You have just put your finger on something that is so large we don’t dare go into it. Suffice it to say, “This is France.” While the french didn’t necessarily invent useless complications, they’ve certainly blazed new trails in it. I didn’t know about that Google Scholar thing-y— as “Google” and “Scholar” are about as far apart in my imagination as two things may be. So, again, thank you, I’ve learned something new. And I’ll try that. But I won’t be able to report on results till later in the week–I think. I love using Google Scholar. I use it for relevance on a topic (just like regular Google works, only for articles and books) and then PubMed for recency. GS also very helpfully gives all citations on a given article/book as well as related manuscripts. Very very handy. It makes it much easier to search through the literature of an interrelated field of work. Much easier to find the paper trail, so to speak. In truth, my own university’s system is overly-complicated as well. While accessing articles through Google Scholar is a breeze, not everything that’s available is indicated as such on GS. So there are times I have to go into the university library website and attempt to find an article. Their search system is, shall we say, NOT equivalent to Google’s usefulness. Sometimes I’m told an article isn’t available through one source, but it ends up being available through another. Then again, through the grapevine I’ve heard our IT department is better know for their faux pas than their brilliance.